You know the one. Probably wearing a tracksuit, often with his initials on it. Quite likely that he’s got his football boots on. He used to be a contender. He could’ve made it were it not for that knee injury (it’s almost always a knee injury), some run of bad luck, or the lack of appreciation for talent on the part of those scouts who came to watch him in his youth. His dream of becoming a footballer died a long time ago but he has a son now so the dream is reborn. The son will live it, fulfil it, and in so doing, will fulfil them both. The father prowls the touchline, offering the benefit of his ‘wisdom’ to junior whether junior wants it or not and never seems quite satisfied with what he sees. Every game is a must win; glory and honour are always on the line. Junior misses a chance and father turns away in disgust, muttering under his breath. You know, that Dad. Dreams, you see, they die harder second time round. Let me be honest, that was my dream too. I wanted to be a footballer from as early as I can remember. It’s not an unusual dream for a Scottish youngster. How close did I come? Well, I suppose I was somewhere near the contender category. I trained with a few professional clubs in my teens. I was good, not exceptional, but I was good. So are a lot of others. If you want to be a doctor or a lawyer or a fireman when you’re growing up then you’ll certainly encounter some competition but nothing like that of the boy who wants to be a footballer. The odds of making it are somewhere in the region of those being offered for Bournemouth winning the Premier League next season. Banking on your son becoming a professional footballer is not a sensible pension plan. When I was 21, I went to America and spent a summer coaching ‘soccer’ at an American summer camp (one of those strange American traditions whereby parents pack their kids off for eight weeks and visit them once for a few hours after about four of the eight weeks). The kids were great; very keen and some of them were quite talented. Every week or so there were tournaments held against other camps in the area (I was based in upstate New York) and the ‘coaching’ that I witnessed at these tournaments appalled me. It was, sadly, mainly from British coaches. These guys were of a similar age to me (all of us failed footballers or else we wouldn’t have been there) and most of them cared only about one thing: winning. It was a pathetic and pitiful sight. They would scream at their players, some of them as young as seven or eight years old, offering nothing of insight and always just selected their biggest players to improve their chances of victory. Sometimes they won but none of their players became much better at football as a result. Don’t get me wrong, I’m a fiercely competitive guy and I hate to lose. I also loathe the trends in school sports of everyone gets a medal and not keeping score. You can’t fool kids, they know who is winning and losing, they know who is good and who is not. The point is that when you’re coaching kids, teaching them to become better footballers, you have to focus on improving their skills and their understanding of the game even if that comes at the expense of the result. Many of my fellow coaches in America took a different view. It was all about them. They celebrated victory like they’d just won the Champions League. Their very manliness seemed to depend on taking home the trophy – the upstate New York Summer Camp Cup or whatever on earth it was we were contesting. I can only imagine that it wasn’t just the meagre size of their trophy collections that these guys were trying to compensate for. Like me, many of these men probably now have children and I hope at least some of them have changed their ways. When I returned to Scotland following my US experience I decided to take my coaching qualifications. There’s no doubt that the quality of football that Scotland produces today is not what it once was and yet, curiously, the reputation of coaching in the country remains excellent. Even Mourinho spent some time learning his trade at Largs. This raises an interesting question. Kids today, especially those connected with bigger clubs, are getting more organised coaching by (generally) better qualified coaches than previous generations so why is their skill level apparently worse? I think there are at least two potential aspects to this. One is the much commented upon decline of what we might call ‘street football’ by which I mean kids just getting together and playing games among themselves without adult supervision or interference. Without, in other words, any formal coaching. Modern life has essentially displaced street football in many areas so despite more time spent in formal coaching sessions it’s possible that many kids actually spend less time in contact with the ball than they used to. Learning via street football is a process of trial and error with more emphasis on what you can do with the ball (showing off frankly) rather than learning the discipline of playing in a particular system for example. The second aspect is that I’m not sure that skill levels have dropped quite as sharply as we tend to assume (I’m talking primarily in a Scottish and to a lesser extent English context here). Go and watch a top level club in Scotland train and you’ll see plenty of skill on display. Go to a match at the weekend and you’ll often be forgiven for wondering where all that skill went. One place it went in my view is through the trap door marked fear. The stakes have been raised in the modern game and the golden rule for a footballer is ‘don’t make a mistake.’ Mistakes sometimes lead to defeats, to the wrath of the manager, teammates, and supporters, to the prospect of losing your place in the team, ultimately to the prospect of being moved on and probably down the divisions. Much of what we marvel at in football involves risk, primarily the risk of making a mistake, giving the ball away, looking foolish. We heap scorn on those who make mistakes. Why are we surprised then that we create a risk averse culture in which getting rid of the ball quickly (and almost anywhere) is deemed preferable to taking a touch and trying to create something? Perhaps those risks are just something that pros have to live with. It’s their living after all and they need to make decisions to protect a career that is often both fragile and fickle. It’s a different story with children though. Let them express themselves. There’s no sadder sight in the game than watching a child kick the ball away in fear. If you are the cause of that fear, hang your head in shame. With my newly acquired coaching qualifications, I volunteered to help coach at a primary school in Edinburgh. It was a very rewarding experience and I was pleased to discover that the vast majority of the parents supported my philosophy of trying to develop the skills of the boys without focusing too much on results. Although of course, guess what? As their skills develop, eventually, results improve quite a lot as a consequence. There is a growing recognition in the game of the need to control the touchline antics of some parents. It’s very frustrating as a coach to have ten or more other wannabe coaches imparting their own, usually contradictory, tips during a game. In some places, silent touchline schemes have been put in place and I think that’s mostly a good idea. I was lucky to have two very supportive parents and the points made here apply equally to Mums as well as Dads. My own mother in fact was always a more animated figure on the touchline than my father. “Tackle” was her constant refrain. She had a simple method of judging my performances: I had played well in inverse proportion to the cleanliness of my kit. Cleanliness may be next to Godliness but it apparently wasn’t next to a career in football. Since we know that most kids won’t become footballers let us at least make the game fun for them. Let us help them develop a sense of love and wonder about it. I firmly believe that football (and indeed sport in general) has much to teach: sacrifice, dedication, teamwork, appreciation of beauty (watch Messi dribble and tell me that isn’t the case), courage, respect, fairness and many other admirable qualities. I have a son who is almost five. He is an utterly wonderful little boy. 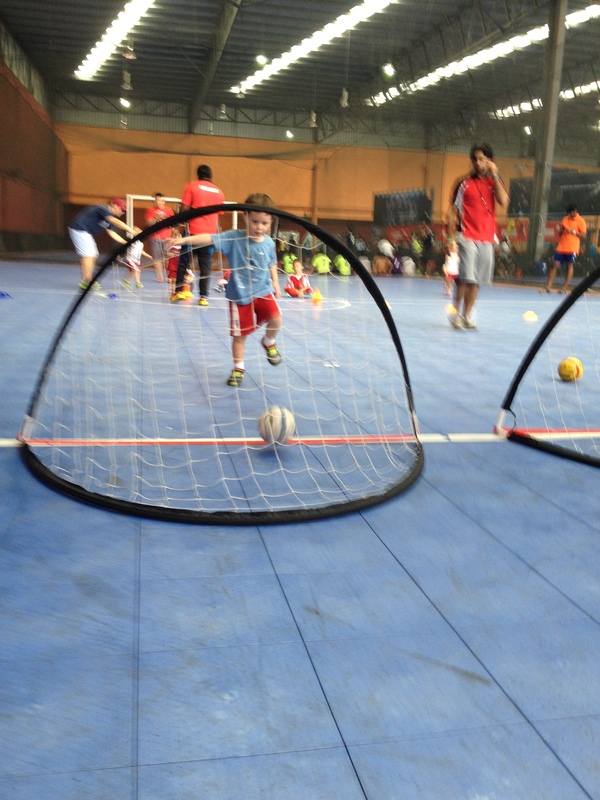 He goes to football coaching classes here in Malaysia (check out www.littlekickers.com.my for anyone who’s interested) and he really enjoys it. Alas, the early indications are that he is far from the most naturally talented little footballer in the world. Would I like him to be? Of course I would. I would burst with pride to see him become a professional footballer. I’ve dreamed that dream. But the chances are he won’t. He’ll probably never play for Barcelona or Real Madrid. He probably won’t play for Dundee United either. But I hope he keeps playing the game, loving it and learning something from it. He’ll never feel any pressure from me to achieve the dream that eluded me. And the funny thing is you can never tell. Judging young talent at almost anything is very difficult and football is no exception. I remember well the most talented player in my age group in the whole of Scotland when I was fifteen, sixteen. If ever a kid was going to make it, he was the one. Outrageously talented and dedicated to his craft, he was the star of the Scotland U/16 team at the time. He did make it; sort of. He became a professional footballer. In fact he became a pro at my beloved Dundee United. He burst on to the scene as the bright young thing, but then? A long slow decline. In total he made only around 50 appearances in the top flight in Scotland before gradually drifting down through the lower leagues and he was the most talented player I ever played with or against. On Saturday I’ll take my little boy back to his football class. I’ll watch with interest but I’ll keep my mouth shut save for some words of encouragement when he comes off for a water break. If he’s having fun I’ll be quite happy enough. He’s not even five years old yet. Who knows what he wants to be when he grows up? He’s expressed an interest in being a lion dancer (google it if you’re unsure) among many other things. He has his own dreams to dream. I’ve made peace with mine. I’m not going to be that Dad.